The Blaine County commissioners and staff on Tuesday will discuss how much funding is needed to bring county roads up to par. County Operations Director Char Nelson will present the county’s transportation plan at 1:30 p.m. The plan lays out which roads are in most need of repair—and how much money will be needed to fix them. It was developed by Meridian-based consulting firm Keller Associates, which subcontracted with local firm Galena Engineering. 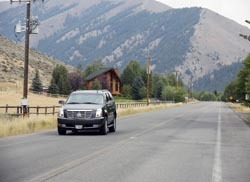 Nelson said the plan was funded by a grant from the Idaho Transportation Department. The plan points to West Glendale Road, Gannett Road, Croy Creek Road, East Fork Road and Buttercup Road as the top five roadways in need of improvements. It states that safety concerns were paramount in choosing West Glendale, Gannett and Croy Creek roads as the roads with “top priority,” meaning they will be repaired as soon as funding is available. Nelson said the safety concerns are determined through crash data, excluding traffic accidents from drunk drivers or other outside influences. West Glendale and Gannett roads are slated for pavement overlays to smooth the surface. Gannett Road would also be widened and get a bike lane. For Broadford Road, the plan calls for making curves less severe, adding bike lanes and improving the entry to a bridge crossing the Big Wood River. However, Nelson said one obstacle remains. Nelson said that the Road and Bridge Department is funded at $1.6 million per year. She said full funding for an annual improvement plan as well as maintenance and equipment replacement would run roughly $6.2 million. She said the major problem is that Blaine County’s Road and Bridge Department is mainly funded through the state gas tax. As the costs of labor and materials are rising, the amount of revenue from the gas tax is falling. The report states that of 33 counties, 180 cities and 58 highway districts in Idaho surveyed in 2011, only 10 of those jurisdictions did not receive any local funding. The report suggests that creating a highway district and establishing a levy for that district could be one way of funding the plan, but also suggests that roughly $724,000 could be raised annually by increasing motor vehicle registration fees from an average of $35 to $65. The discussion will be held Tuesday, Sept. 11, at 1:30 p.m. at the Old Blaine County Courthouse in Hailey.